Students gathered around the flagpole at Danforth Junior High School for an important lesson from local veterans on the protocol for raising and lowering the American flag. A sixth grade history class joined with eighth grade office aids, who are charged with the proper care of the flag. 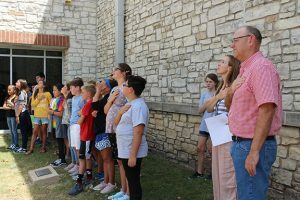 Left, Students in Ms. Lori Pharis’ sixth grade World Cultures class join local Veterans and Danforth Junior High School principal Greg Howard, in saluting the flag. Feature photo, Danforth Junior High Students, Saraya Manning, Jack Boyle and Cody Overall bring down the flag flanked by representatives from The Veterans of Foreign Wars of Wimberley.